You are considering or already made the switch to this reusable menstrual product and now you are wondering about how to wash your cloth pad? Here is a blog article that gives you some cleaning tips…and is followed by PART 2: Choosing a soap to wash cloth pads and PART 3: Introducing the new Cloth-Pad-Soap made by our friends at MGEcoduties. We frequently get asked how to wash our cloth pads. 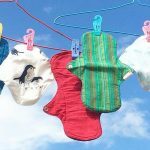 There are a few steps that are essential when it comes to washing reusable menstrual pads. We recently updated our product leaflet for you. Here it is! In the care instructions we share a step by step washing routine. Have a look, you might find it helpful, even if you are already using cloth pads. Soaking in cold water first is essential for removing blood from all materials, not just cloth pads. It’s important to avoid hot water during the first rinse, because it sets blood stains. Leave for minimum 30 minutes. Facing the used side downward facilitates the soaking routine. This is a great tip gained from user experience: The blood “falls” out of the fabric to the bottom of the water bucket, as opposed to setting deeper into the pad if soaked facing upward. Try it out and notice the difference! Rinsing until the (cold) water runs clear after the soaking process, will clean most of the blood out of the fabric. Washing with soap further helps remove residues, especially to wash out the fat-based blood components. You can wash your pad by hand, or in the washing machine along with other clothes. Pulling the wet cloth pad into shape helps to keep its form and avoid cotton shrinkage. Thorough drying is important. You can do this on a clothesline, or in a tumble dryer on low heat. Drying in direct sunlight can help prevent staining and is a natural sanitizer. Use a little baking soda (not baking powder) to attack old stains you didn’t wash previously. Add a little white vinegar to the water of your last rinse to help keep the fabric soft. This is especially useful if you live in an area with hard water. Our Foldable Pad is ideal for quick drying. You can unfold it! This is especially useful while traveling, for cold climates and during Indian monsoon season. Every cloth pad user develops their own washing routine that matches the rhythm and routine of their life. Some wash each single pad immediately after use. Others wash their daily batch at the end of each period day. Again others collect all pads throughout their whole period and wash them all together at the very end. Find out what works for you. 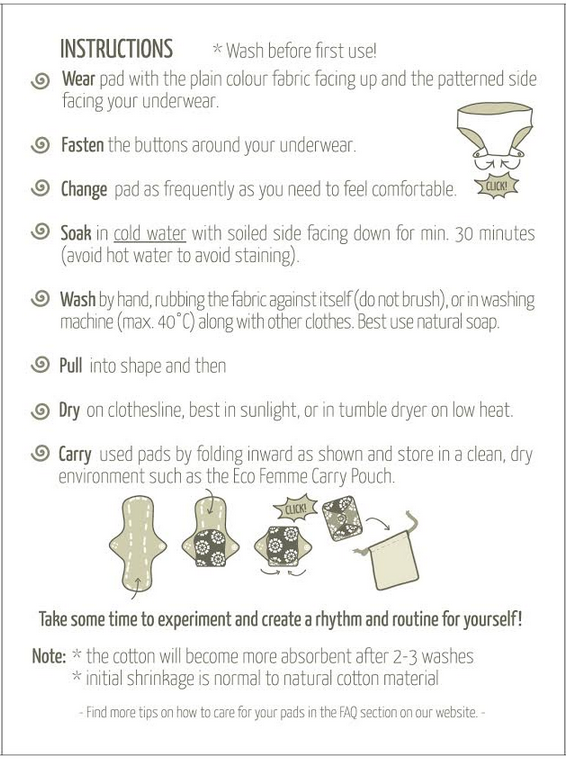 Have a look at Eco Femme user Anita’s washing routine. *Cover image credit: @we.for.vegan (Hong Kong) with thanks!